Stamp till U Cramp: The Altered Alice: Chapter 15 - Week 3 - Any Way You Go Will Get You Somewhere! 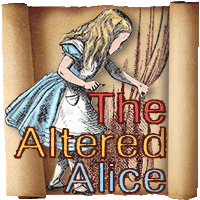 The Altered Alice: Chapter 15 - Week 3 - Any Way You Go Will Get You Somewhere! Any way you go will get you somewhere, so this month's challenge at The Altered Alice is ANYTHING GOES! It's all up to you, and we can't wait to see what road you will take with YOUR project. Wonderland entries are encouraged; you will be rewarded with two chances at the draw instead of one. Multiple entries are fine as long as each is on a separate post. You have until May 25 to enter! Our sponsor this month is the amazing Alpha Stamps [Store | Blog], and Alice fans are in for a real treat when they shop in this magical store! Alpha Stamps features exclusive rubber stamps, collage sheets, paper dolls, kits and collage supplies of all kinds. Their Alice in Wonderland selection is HUGE! Other shopping themes include Steampunk, Birds, French Vintage, Circus, and many more. I love it that you can shop by theme or product type. Be sure to enroll in their newsletter, as the supplies used in the latest artwork from their talented design team are often on sale! They also have fun challenges that are hosted on their Facebook page. The winners are chosen by the number of "likes" each project receives! The Prize - Anything Goes and Everyone Wins! The Altered Alice design team will be working with this newly released exclusive "Alice's Adventures" stamp set from Alpha Stamps, plus some Alpha Stamps exclusive collage sheets and other collage supply goodies! ONE randomly drawn winner will receive the same "Alice's Adventures" unmounted rubber sheet that the design team is using! 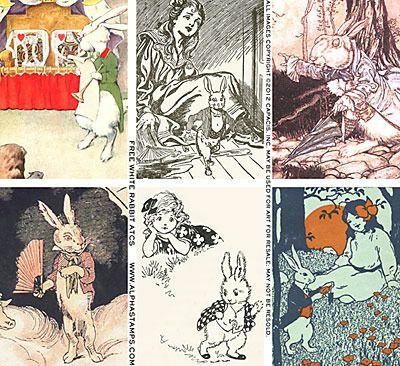 EVERYONE who participates in the challenge will win a brand new digital White Rabbit ATC Collage Sheet, emailed at the end of the challenge! SO DON'T BE LATE - enter by here by May 25! 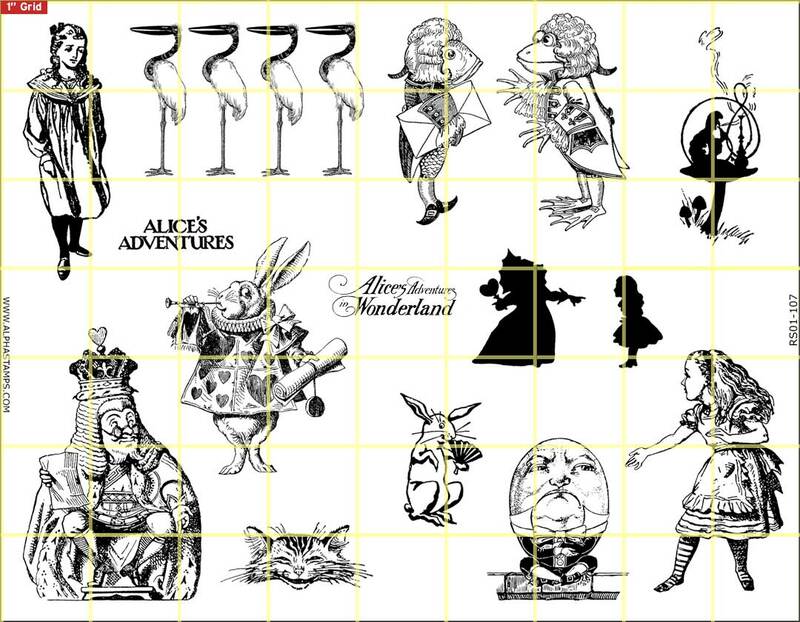 And if you just can't play along, you can still enjoy ALL ALICE ON SALE at Alpha Stamps, now until May 26, 2012. So get going and let's see where you go with this fabulous Alpha Stamps challenge!